The Naperville car accident attorneys at Rosenfeld Injury Lawyers LLC understand that increased traffic congestion continues to be an inescapable problem for commuters in the Chicago Metropolitan area. In fact, the congested traffic during peak hours in Naperville, Illinois overloads the existing transit systems and roadways every business day. The Chicagoland area is home to two of the four most congested national highway systems within the US – Interstate 90/Interstate 94 including the I-90 Circle Interchange. If you or a family member was injured in an auto accident and are in need of a Naperville, IL car accident lawyer, contact Rosenfeld Injury Lawyers LLC today for a free consultation. These congestion problems regularly account for some of the serious motor vehicle collisions our personal injury law firm handles in Naperville. 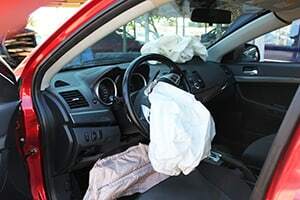 If you or a loved one suffered injuries in a Naperville car crash, we encourage you to talk to a Naperville car accident attorney for free to learn more about your legal rights. The frustration of being stuck in traffic for hours on end is only part of the problem. Exasperated motorists expect delays caused by traffic accidents occurring from reckless actions of distracted drivers. However, not every major accident happens in 'start and stop' traffic. Drivers will often push the limits of safe driving on roadways and side streets to get home or to work on time. As a result, helpless others are often victimized by the careless actions of negligent drivers causing serious accidents. 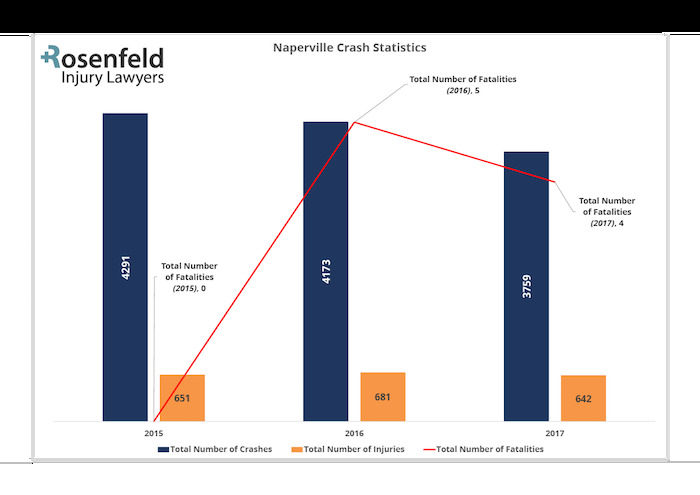 Many of these Naperville care crashes involve severe injuries and fatalities in densely populated areas of Chicagoland from downtown radiating to its outlying suburbs. In March 2015, Naperville law enforcement officers responded to the report of an accident occurring at Modaff Road and 75th St. indicating a bicyclist was hit by a vehicle. First responders arriving at the scene observed a 2009 Chevrolet van and a bicycle rider at the intersection. 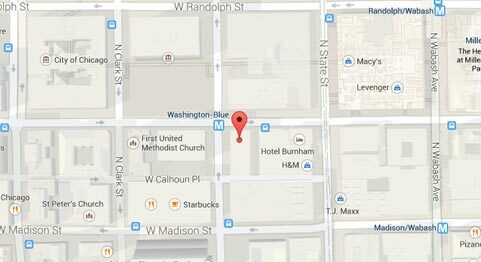 A preliminary investigation showed that the bicyclist was traveling northbound when it was struck by the Chevrolet van moving westbound on 75th St. The cycling victim of the bicycle accident suffered serious injuries and received emergency medical attention at the scene of the crash before being transported to a local hospital. Just three months later, a driver was arrested for allegedly crossing her vehicle into opposing traffic before colliding with another car traveling northbound on Raymond Dr. at Queensgreen Cir. The motorist was charged with improper lane usage and DUI (driving under the influence) of alcohol. The injured victim in the other car was extricated from the vehicle by the local fire department and transported to the Naperville Edward Hospital suffering from serious injuries. Severe car accidents in Naperville Illinois are not uncommon. In fact, two individuals lost their lives in fatal accidents in 2012 in an accident occurring on East Diehl Road close to Centre Point Circle and a separate accident at Royal St. George and Briargate Drive. In 2013, another victim lost their life at the scene of a fatal accident on East Diehl at Freedom Drive. Where do Auto Accidents in Naperville Occur? In the summer of 2007, Naperville City Council endorsed the city’s Red-Light program to reduce serious injuries and fatalities in the community. The council initiated the to decrease the numbers of red light violations occurring at major intersections throughout the city. By 2009, many of the red light cameras were installed at major crossroads in the hope of reducing the number of crashes occurring in the community. The system is designed to capture an image of a motorist causing a traffic violation when turning on a red light without stopping. The system designed to increase pedestrian and bicycle safety tickets drivers who fail to stop at an intersection where right turns are permitted on a red light. While the program has been somewhat successful, serious accidents with injuries still occur. Being involved in a Naperville car accident often creates a host of questions including which parties are at fault, who will pay for your damages and can you be reimbursed for lost wages. In many situations, claims adjusters working for insurance companies will attempt to settle the case quickly to minimize their financial payout. However, many victims are unaware of the seriousness of their injuries and the value of their case and settle for an amount far below fair compensation. Because of that, victims will hire a Naperville car accident lawyer to resolve the claim successfully. Attorneys specializing in Naperville motor vehicle accident cases are extremely knowledgeable about relevant Illinois civil tort laws and the state’s procedural rules that significantly affect the case. Skilled lawyers can advise you of the statute of limitations deadlines that could permanently prevent you from ever filing a claim or lawsuit. Also, an experienced Naperville car accident attorney can file a lawsuit or claim on your behalf and build your case based on every possible defense raised by the other side – the party at fault for the accident. Rosenfeld Injury Lawyers LLC can help level the playing field especially when you are facing the vast resources and experience of a large auto insurance company. Rosenfeld Injury Lawyers LLC at (888) 424-5757 can work on your behalf and perform all the legal legwork in negotiating a settlement or taking your case to trial. Our personal injury law firm understands the ins and outs of handling large and small accident claims. We have extensive experience in dealing with various insurance companies and can build your case by gathering necessary evidence including witness statements, police reports, lost wages information, loss of future earning capacity, medical records and hospitalization bills. Our law firm serves as your legal advocate and representative to negotiate your claim. We work on your behalf throughout the claims process to ensure that you receive adequate recompense by presenting your Naperville motor vehicle collision, bicycle accident, motorcycle accident or pedestrian injury case in front of a judge and jury when necessary.